Guns are in more than one third of all U.S. households? They're a very real danger to children, whether their caregivers own one or not. Of the 192 million firearms owned in the United States, 65 million are handguns? Research shows guns in homes are a serious risk to families. A gun kept in the home is far more likely to kill someone known to the family than to kill or injure a household member than kill or injure an intruder? A gun kept in the home triples the risk of homicide? The risk of suicide is five times more likely if a gun is kept in the home? Children should not have access to firearms and parents should talk to children about the hazards of gun use. Even if they don't own a gun, chances are their friends or neighbors do. That's why it's important to talk to kids about the potential dangers of guns, and what to do if they find one. Gun owners should always store firearms (including BB or pellet guns) unloaded and locked up, out of reach of children. Ammunition should be locked in a separate location, also out of reach of children. 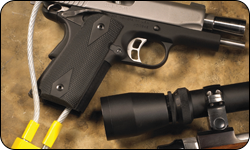 Quality safety devices, such as gun locks, lock boxes or gun safes, should be used for every gun kept in the home. Keep gun storage keys and lock combinations hidden in a separate location. Check with neighbors, friends and relatives or adults in any other homes where children may visit to ensure they follow safe storage practices if firearms are in their homes. They should never touch or play with guns. They should tell an adult if they find a gun. If someone they are with finds a gun, they should leave the area immediately and find an adult.